In closed top jar combine vinegar, oil, chutney, sugar, salt, curry powder and mustard. Cover and chill. Place torn spinach in large salad bowl, top with apples, raisins, green onions and optional peanuts. Shake dressing and pour over salad. 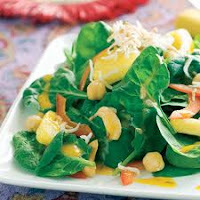 The spinach salad recipe makes 6-8 servings...enjoy it !